NCSECS and Equity Coalition members developed the "Principles of Equitable Schools," [Principles] to establish a standard of equity intended to help parents, policy makers and other stakeholders weigh their options when choosing a school. Through these essential principles, NCSECS and the Equity Coalition aim to establish core principles that should be upheld by any school enrolling students using public dollars. 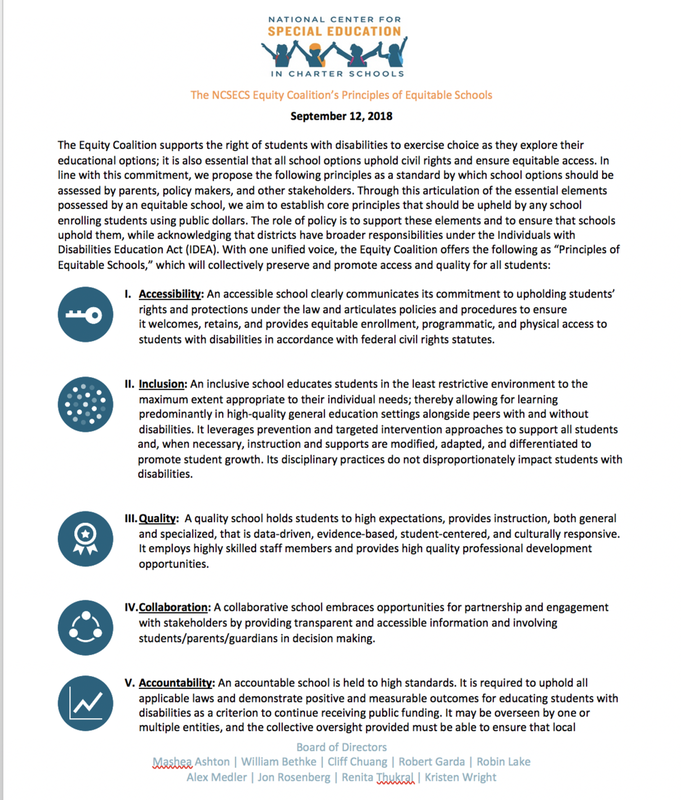 With one unified voice, the Equity Coalition offers the following Principles to collectively preserve and promote access and quality for all students. We invite all stakeholders who are invested in achieving equitable options and outcomes for students with disabilities to demonstrate their commitment by signing on to the Principles. Policymakers will strive to align their statutes and appropriations with the Principles. Informing advocacy efforts at the state and federal levels.